Dejima (出島, literally "exit island"; Dutch: Desjima or Deshima, sometimes also written as Decima or Dezima) was a small fan-shaped artificial island in the bay of Nagasaki. It was built in 1634. The island was made by digging a canal through a small peninsula. It was the only place of direct contact and trade between Japan and the outside world during the Edo period. Dejima was built to keep foreign traders out of Japan as part of "sakoku" self-imposed isolationist policy. It was built at first for Portuguese traders. It then changed to a Chinese and Dutch trading post from 1641 until 1853. It covers an area of 120 m x 75 m (9000 square meters, or 0.9 hectares) and has now become part of the city of Nagasaki. "Dejima Dutch Trading Post" is now a Japanese national historic site. 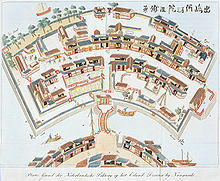 An imagined bird's-eye view of Dejima's layout and structures, 1824-1825 Note the island's fan-shape. Dutchmen with Courtesans in Nagasaki c.1800. In 1543 Portuguese traders were the first to set foot in Japan, on the island of Tanegashima. Six years later Jesuit missionary Francis Xavier came to the island of Kyushu at Kagoshima. At first Portuguese traders were based in Hirado. Then they started a search for better port. In 1570 a powerful landowner or daimyo called Ōmura Sumitada became a Catholic. (He chose Bartolomeu as his Christian name.) He made a deal with the Portuguese to make Nagasaki better for trading. Soon the port was open. In 1580 Sumitada gave the jurisdiction of Nagasaki to the Jesuits. The Portuguese became the only ones trading silk with China through Macau. Shogun Iemitsu ordered the creation of the artificial island in 1634. He did this at first to keep the Portuguese merchants living in Nagasaki in one area. After a rebellion of the mostly Christian population in the Shimabara-Amakusa region, the Tokugawa government banned all Western nationals except the Dutch employees of the Dutch East India Company (Vereenigde Oostindische Compagnie, VOC). Without the yearly Portuguese ships from Macau, the economy of Nagasaki suffered heavily. Since 1609 the Dutch had a trading post on the island of Hirado. Government officials made the Dutch move from Hirado to Dejima. From 1641 on, only Chinese and Dutch ships were allowed to come to Japan. Every ship that came to Dejima was inspected. The sails were taken off until that ship was ready to leave. Religious books and weapons were taken away. Religious services were not allowed on the island. The island of Dejima was part of the city of Nagasaki. Dejima was small, 120 by 75 meters. 25 local Japanese families owned the land. They got a yearly rent from the Dutch. The island was linked to the mainland by a small bridge with guards. There were houses for about twenty Dutchmen and warehouses for goods. The Dutch were watched by a number of Japanese officials, gatekeepers and night watchmen. There was also a head supervisor (otona) who had about fifty people working for him. There were a number of traders to sell the people on Dejima food and drink and other items they needed. There were also about 150 tsūji ("translators"). They all had to be paid by the VOC. Like the city of Nagasaki, Dejima was under direct supervision of Edo by a governor (Nagasaki bugyō). It was very expensive for the Dutch to pay for their trading post. But their trade with Japan was very profitable for the VOC. At first they made profits of 50% or more. Trade became less in the 18th century. This was because only two ships per year were allowed to dock at Dejima. The VOC had no more money in 1795, and went bankrupt. After that, the Dutch government took over the trade with Japan. Life on Dejima became especially difficult when the Netherlands (then called the Batavian Republic) was under French Napoleonic rule. All contact with the homeland was broken off. For a time Dejima was the only place in the world where the Dutch flag was flown because they were not ruled by France. The most important Dutch official in Dejima was called the Opperhoofd by the Dutch. The Japanese also called him Kapitan (from Portuguese capitão). ↑ Edo-Tokyo Museum, exhibition catalog, p. 207. ↑ Society for the Diffusion of Useful Knowledge. (1833). "Japan," Penny cyclopaedia, Vol. 13-14, p. 94. ↑ Society for the Diffusion of Useful Knowledge. (1839). "Japan," Penny cyclopaedia, Vol. 13, p. 94.